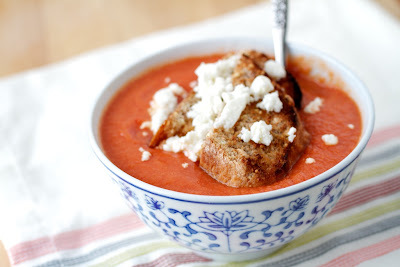 Chipotle Tomato Soup | Naturally. There are certain kinds of food I could eat everyday during the winter. I love mac and cheese, warm stir fries, and soup- lots and lots of soup. Personally I think the soups I make are slightly more healthy than eating mac and cheese everyday but I still love my comfort food. Yet I like soup that I can throw together fairly easily, not a long list of ingredients, and I don’t have to stir often. Give me a soup like that with some crusty bread and I will be content. This soup is one of those. I made a roasted tomato soup a few weeks back but the flavor of the tomatoes weren’t quite right- by using canned tomatoes, I don’t have to worry about peels and this gives me reason to start canning this summer! 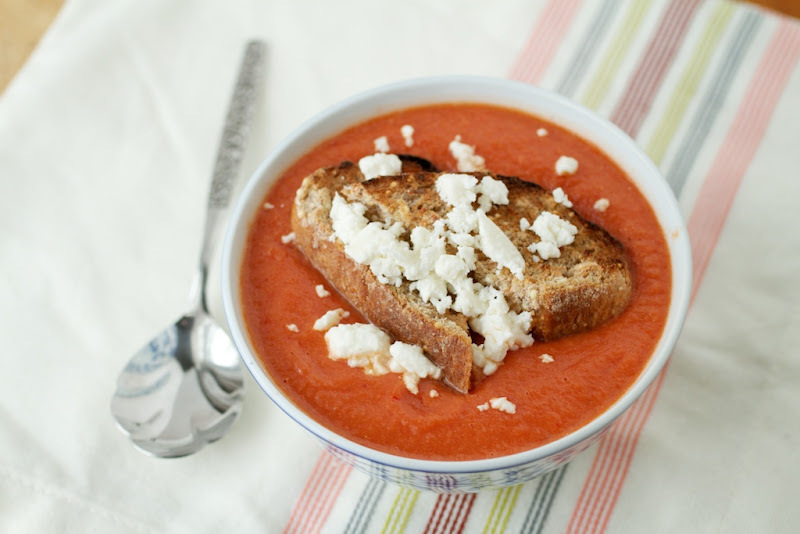 Adding the feta and the chipotle add in an extra bit of pizazz to this soup. Pre-heat oven to 400˚. In an 8×8 pan combine the can of tomatoes, onions, and chipotle pepper*. Place in oven and cook for 40 minutes. Once tomatoes begin to brown, remove from the oven and pour into a pot. 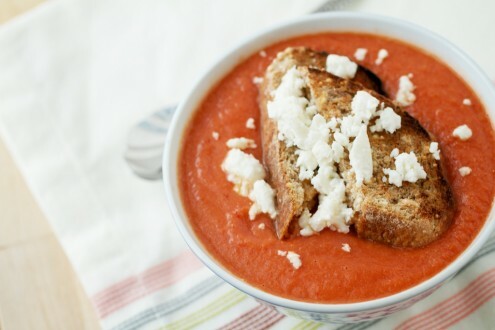 With an immersion blender, puree tomatoes (if no immersion blender, use a regular blender.) Add enough milk to bring to a consistency you like and re-heat the soup. Pour into the bowls and top with croutons and feta. A note about the Chipotle Pepper: I used two and found it to be just a tad bit over powering and that is why I reduced the recipe to one. However, if you still want the flavor with little heat add the adobo sauce to the pan inside of a pepper to reduce the heat. what a beautiful looking soup:) your pictures are just gorgeous. YUM! I love the addition of feta. Your croutons look terrific! How did you prepare and what is the bread?